Rawa Idli is a famous south Indian dish.It is a one of simple recipe which we can used for quick meal, dinner, lunch etc.It is a very healthy and complete your appetizer.It is very soft and very easy to make.You can enjoy this by making it at home.The ready made MTR is also available in market by using which you can also make idli.You can also use it as a snacks and serve it with peanut sauce or coconut chutney. In a flat dish, microwave 1 tbsp oil for 1 minutes. Microwave it for 1 minutes and add curry leaves & salt. Add coconut, curd, water, mitha soda.Keep aside for 10 minutes. Grease small glass bowl or micro proof idli maker. Pour 3-4 tbsp mixture in each bowl. Arrange in a ring in microwave . Microwave it for 4 minutes. If the idlies appear wet, wait for 5 minutes. After 5 minutes usually they get done. Method is almost same, take a pan add some oil and also add rawa suji in it. Put it into a bowl and add salt and curry leaves in it. Now add water, curd and mitha soda in it, mix it properly. Cook it for 6-8 minutes. After 7 minutes open the cooker and refer to put the knife in idli. 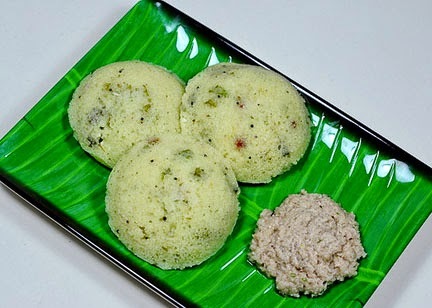 Garnish idli with curry leaves and serve it with coconut chutney or peanut sauce. You can also add a finely chopped mixed vegetables likes beans,carrot,cabbage and peas in idli batter. You can also make idli by using ready made rawa idli MTR.